I never got out of the pearl hall! This entry was posted in Pearlescencery on September 19, 2015 by WendyG. 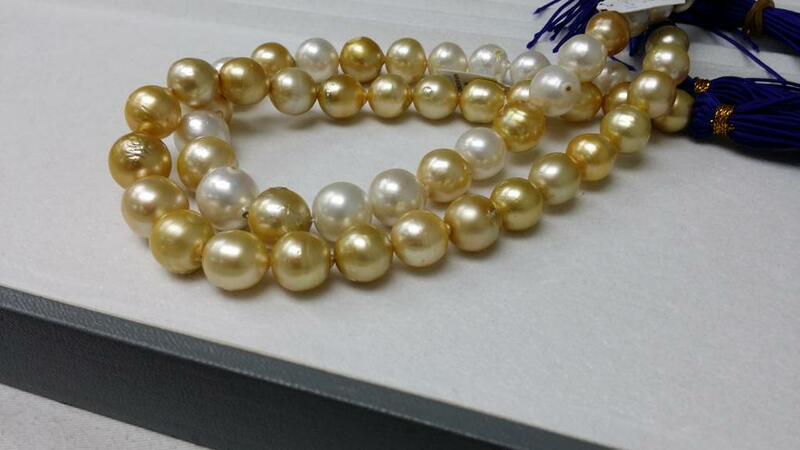 These pearls came from the same stable as the finest Edison pearls – bead nucleated pearls – with strands costing many £kkkk. Felt smug that,because the firm did not manage its second harvest in March (due apparently to local government actions – it’s the same the world over) there were no more of the vibrant deep pinks as per my present to myself. 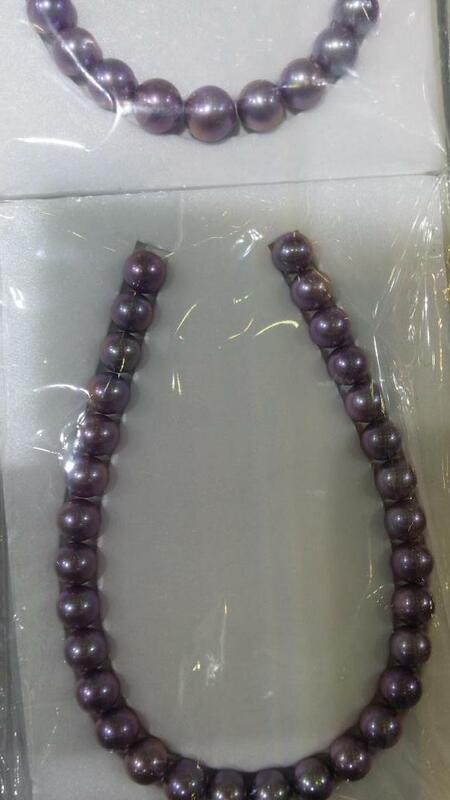 Closest was this deep purple-ish strand – very expensive – but, like most purples, not metallic and the purple was grubbied with a brown cast. 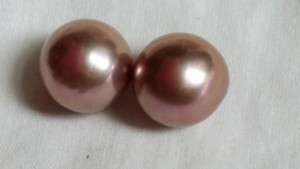 All pinks to purples are prone to drop to beige brown. Bye-bye Hong Kong for this year. 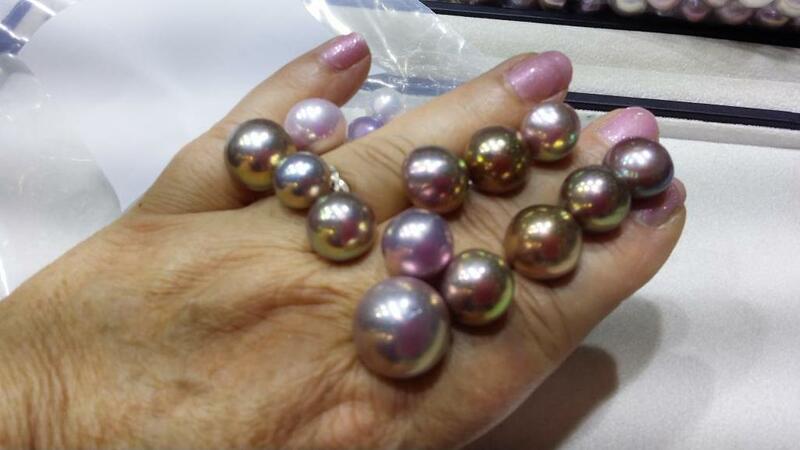 It’s been a wonderful trip with good friends, great food and fabulous pearls. 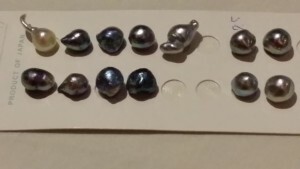 This entry was posted in Pearlescencery and tagged akoya pearls, baby ripple pearls, grey pears, natural colour akoya pearls, ripple pearls, vietnamese akoya pearls on September 17, 2015 by WendyG. Opening day for the Gem show. Since I had the bulk of what I wanted already this was a nice day to browse and select just those few unusual items which make the trip even more worthwhile. 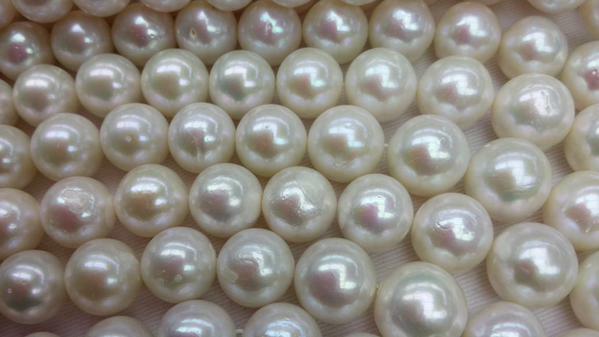 I’m not a huge akoya pearl person. There are too many people who specialise in a very specialised market where competition is fierce and often comes down to price…in which ccase the big expert boys can bulk buy and get better deals. 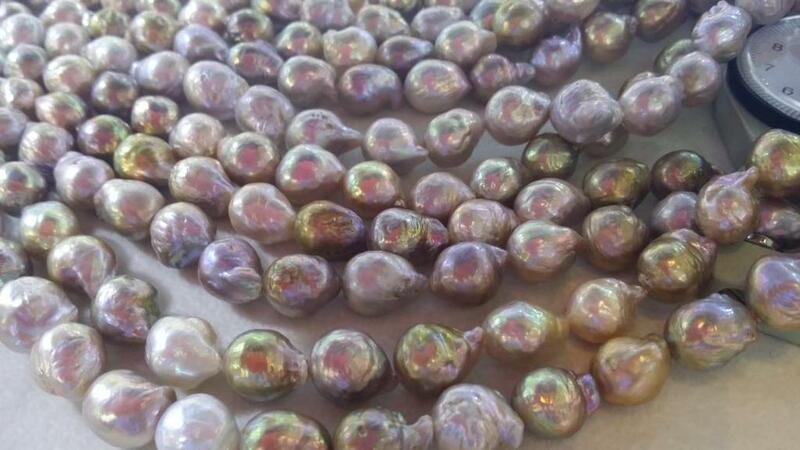 At the other end it is all too easy to be sold some cheap shiny beads with a microns thick layer of nacre which will disappear within a year. That is sadly the end of the market where the discount sellers operate. 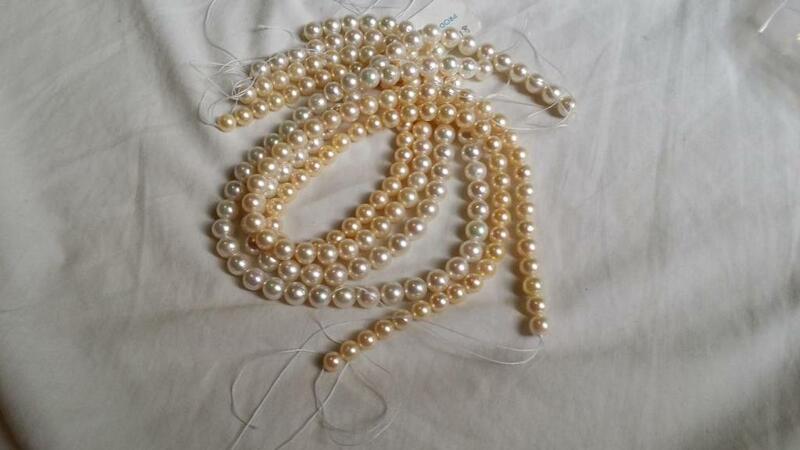 Since buyers are almost invariably disappointed with their bargain pearls we can all end up tarnished with that same brush. 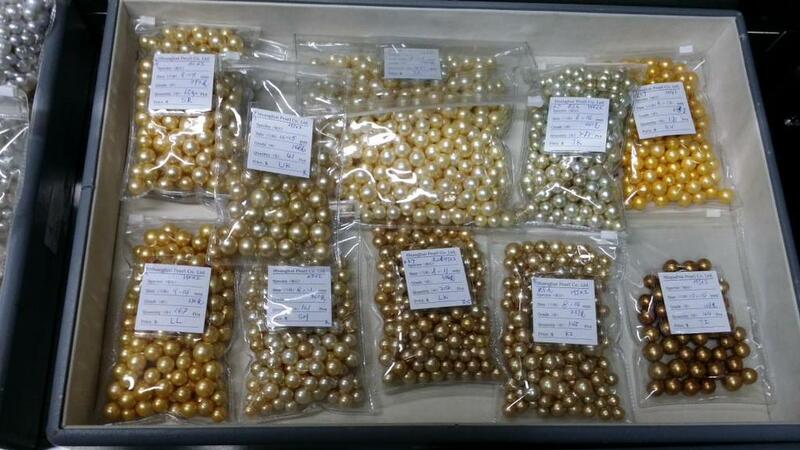 With pearls there really are no surprise bargains. Everyone really does know the price of what is being sold. HOwever, I’ve been happy to dip a toe in the outskirts of the akoya market with some of the more unusual colours and baroque which I can get for a great price. So I was really pleased to spot these few really strongly coloured (natural colours) rainbow greyish Vietnamese rounds from Spica. 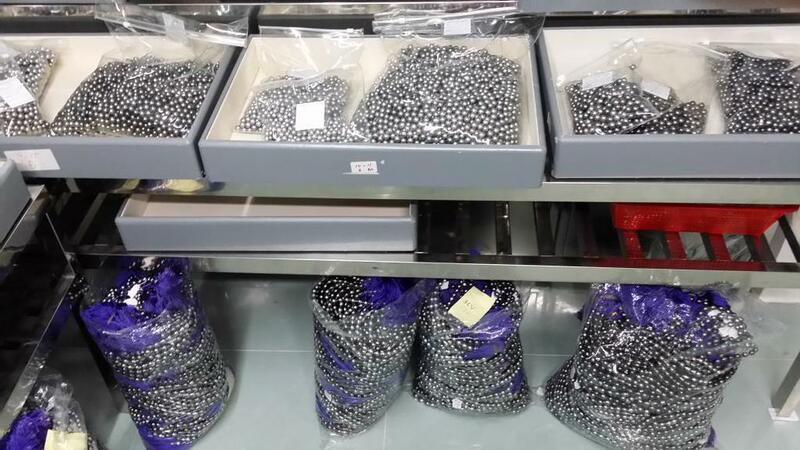 Plenty of dyed grey, some black and many dyed gold akoya around as well as white white. Both pinked and unpinked. But no natural pastel multicoloureds this time. 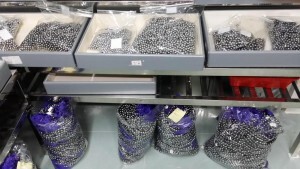 Since by this time I had been walking up and down for about three hours I decided to sit down at the home of Edison pearls with my friend Cicie who set me to ‘play about’ with some really nice Edison rounds. 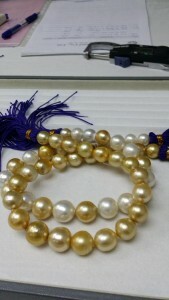 I can’t help it, Put pearls in front of me and I make pairs. These were lush colours and besides finding a couple to add in to my March birthday present to me necklace I found the earring pair .. and a coupe more. Looking at Edison rounds. Bliss. These haven’t come out well, they are in fact a deep purple. With no trace of brown. 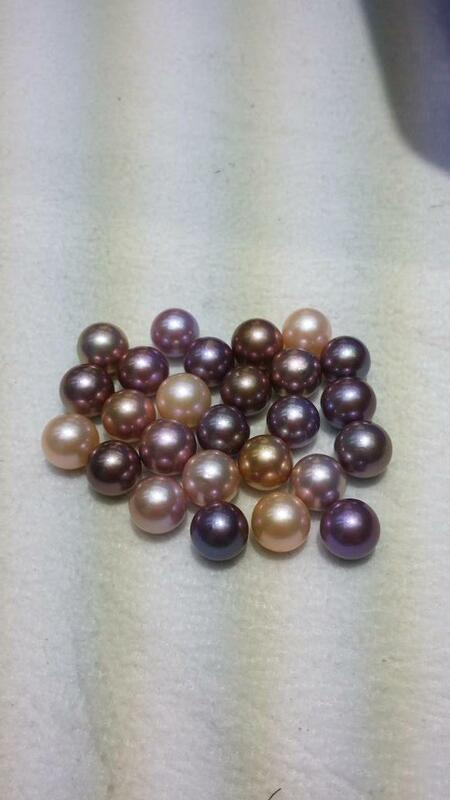 This entry was posted in Pearlescencery and tagged akoya pearls, dyed pearls, fireball pearls, spica pearls, vietnamese akoya pearls, vietnamese pearls on September 17, 2015 by WendyG. A busy and successful day. Started with a visit to the main findings house, where an hour or so of browsing the many tiny drawers produces the stash of gold and silver to enable the making for the next few months. Thank the gods of jewellery that the price of gold has dropped. Plus I was able to get just about everything I had on the list. 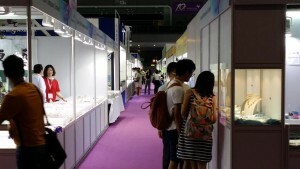 It’s so much easier to shop for findings in a cool atmosphere (literally, with aircon plus only me in the sales room)while the stand at the show is chaotic. I’ve never seen fights break out but there is some serious elbow action and shoving as peeps jostle to get to find the right tiny packets. One person came in while I was there, prowled around the room asked if they were going to be out at the airport for the show and then left…why would anyone do that? I was able to chat to the super knowledgeable staff and get some very good suggestions on what to use to achieve what I wanted. No chance of that with the scrum at the show. It’s always so much more relaxed and friendly and calm at the offices before the show. Plus you get the chance to really poke around and find the good stuff. 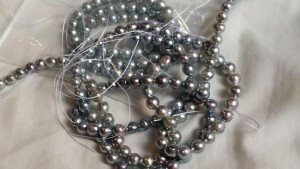 After a couple of hours there I moved on to my favourite supplier of south sea and tahitian pearls. 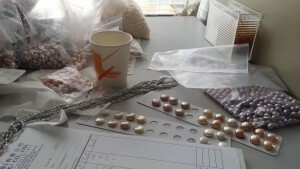 I was looking for some gold half drilled drops but no joy – no decent pairs for earrings. But I did find some lovely strands, including these two, at up to 17mm. These two are both natural colour different gold shades with some white in one of the strands. 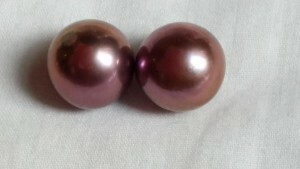 They are huge – up to 17mm – with great colour and lustre. Yes, flaws but otherwise, wowser! 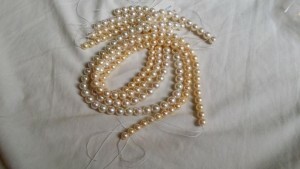 Also some smaller rounds strands, again great lustre and very strong colours. Looking through the stocks in the wholesalers vault I spotted this collection of loose single undrilleds. 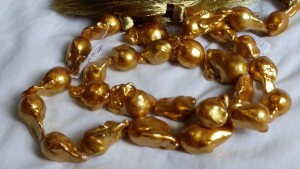 Including bags of dyed gold south seas. Yuck. Whether they are dying freshwater or south sea to look like the rich high end golds, the colours are invariably horrible ear-was tones. Do not be fooled. I’m afraid I passed on the tahitians. just didn’t get excited by them, though there were plenty. 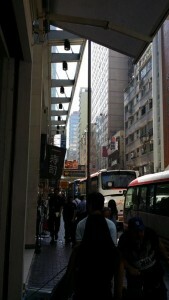 Finally..a shot of the street outside the South Sea wholesalers. All tall buildings and a throng of people. I’m having a break on Tuesday, then the show opens tomorrow – lots of photos! 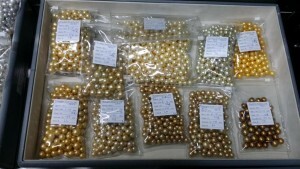 This entry was posted in Pearlescencery and tagged findings, gold, gold south sea pearls, kowloon, siver, south sea pearls, tahitian pearls, tsim sha tsui on September 15, 2015 by WendyG. Sometimes I find myself wishing that Hong Kong wasn’t quite so far away. Being here is fabulous, but the long flights are to be endured to some extent. We can’t all jump on a plane as soon as we feel an urge to buy a couple of strands! 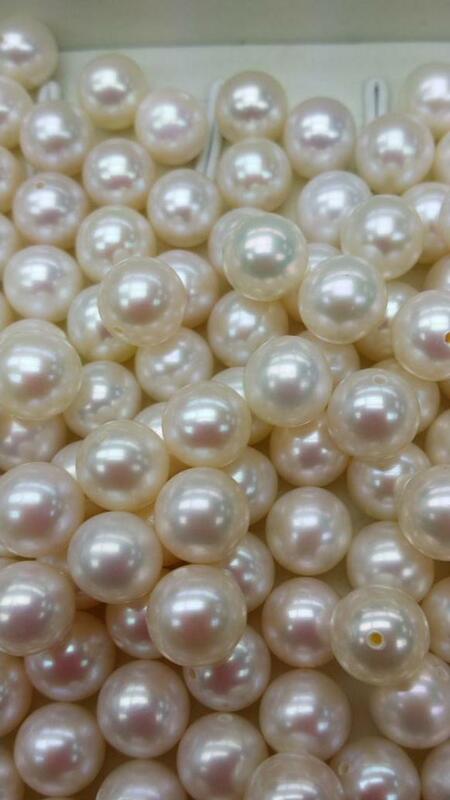 So far my friend in pearldom, Patricia, hasn’t managed it. So today I did a fun surprise and video called her from a wholesale office and roped her in to help select some strands. We found some great white rounds, all metallic and then I found a bag with a few hanks of really strongly coloured near round natural colour pearls – you can see the picture. It’sturned them a bit grey rather than nice pinks etc but you can see that they are strong colours. There’s quite a lot of washed out peach around. I met Jack Lynch of Sea Hunt Pearls. 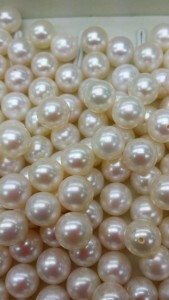 We had a small joint moan at the lack of plentiful good high end pearls. Due in most part to there only being one harvest this year because of the downturn in the china economy. There are none of the stunning deep pink to purple bead nuked strands around this time. Jack had a more purple strand to my raspberry-ish one. I was thinking that I would find a couple more pearls to lengthen it but can’t even find two! And dream on for a pair of undrilled or half drilled for some earrings. Commercial grade pearls plus lots of peach are available, but I’ve had to burrow deep in bags to find the metallics. It proves the value of schlepping all the way here at least and why we few do it. This entry was posted in Pearlescencery and tagged pearls, skype on September 13, 2015 by WendyG. You know that thing where you see someone out of context and know that you know them but how? Where? Who? That’s what’s been the biggest smile (apart from the Hong Kong pearls of course) this trip. Waiting to meet the American pearl goddess Betty Sue King of King’s Ransom Pearls (pearlgoddess.com ) someone came up to me who clearly knew me but equally clearly could not place me. T’was Lynn from one of my wholesalers. 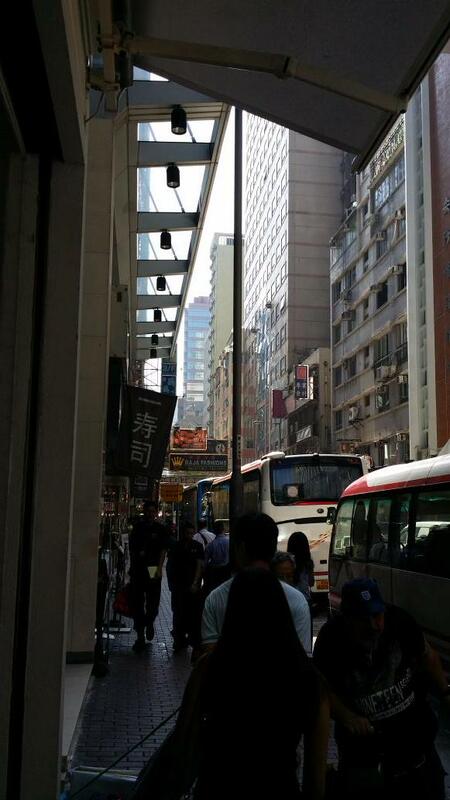 Who was not expecting to see my standing on a HK street as she went home. Then along came another supplier. It was fun and a very small world moment. Apologies for the late start to the trip’s blog, by the way…my laptop decided to forget my password somewhere on the way here. 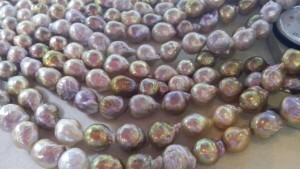 The pearls have been plentiful and I’ve found many great metallics. There’s still a shortage of natural colour half drilled and undrilled in strong colours, especially that elusive lavender to purple range where lustre drops away and a dull brownyness creeps in. This is what I mean by strong colour! 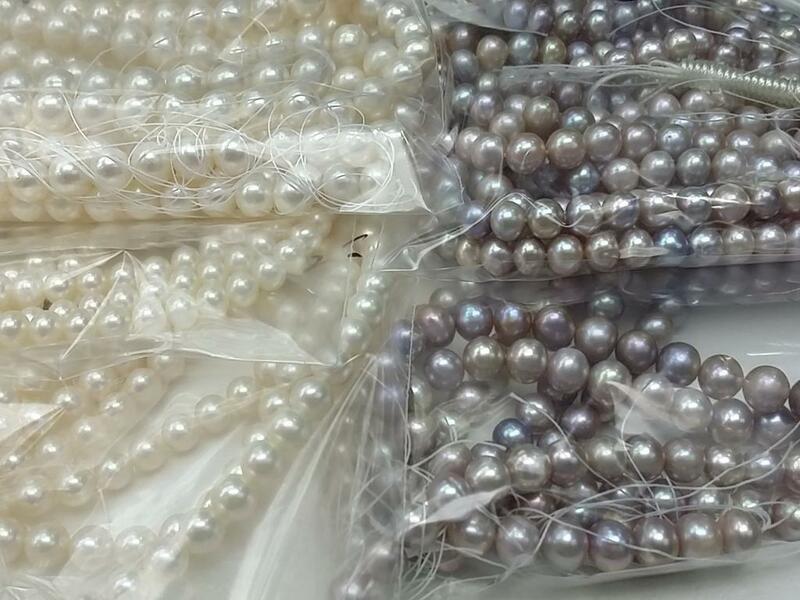 Classic white pearls have been very popular in the last few months so first order of business was to find strands, undrilled and half drilled. For anyone who thinks matching white pearls is easy..I think I managed to catch some of the subtle nuances of tone and undertone in these white undrilled round…then of course there is quality of lustre and shape and size to consider. 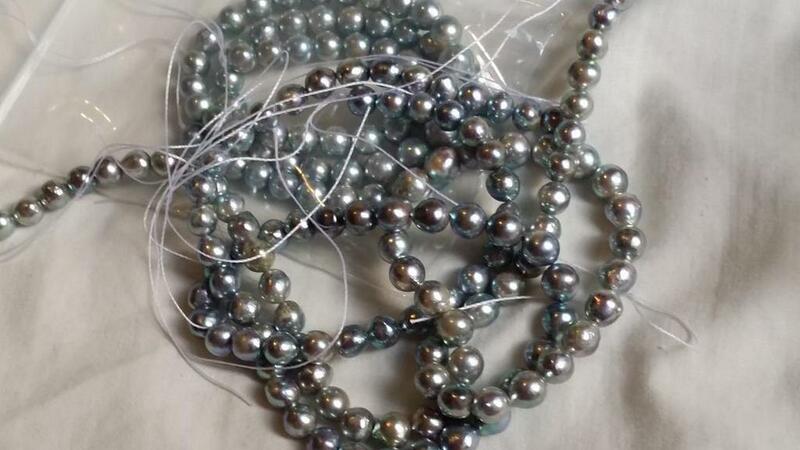 I found some great metallic huge white round strands – up to 15mm, roundish, some flaws but hhhhhhhuuuugggeeee. White strands. Round…metallic…what’s not to forgive a few flaws? Finally, from one wholesaler, some tiny keishi strands with great lustre and delicate colour and some huge metallic buttons for great earrings which sit neatly on the lobe, have great impact but won’t flop. 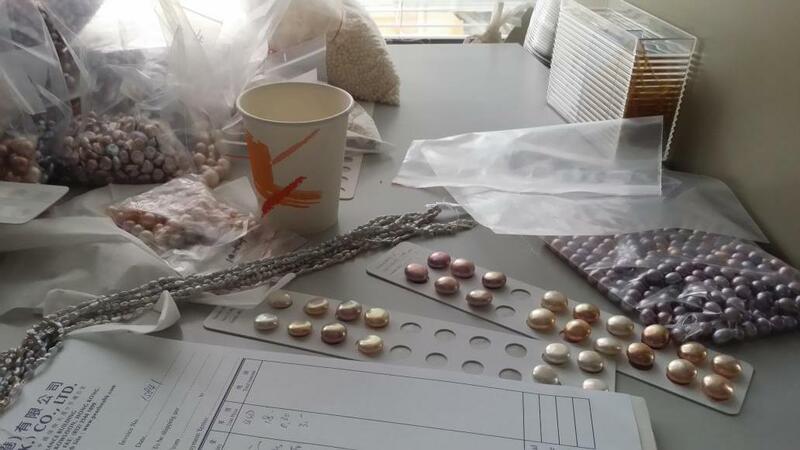 This entry was posted in Pearlescencery and tagged hong kong, hong kong gem show, hong kong pearls on September 13, 2015 by WendyG.